The imposing GPO (General Post Office) built in 1818, is the oldest operational General Post Office in the world. It is the centrepiece of O’Connell Street - Dublin’s widest boulevard and principal ceremonial space. In 1916, Irish rebels seized it as the seat of their provisional government. The ‘Proclamation of an Irish Republic’ is the manifesto from which the modern Irish state claims legitimacy. The consequent bombardment of central Dublin by British artillery, combined with the summary execution of the leaders, and internment of thousands of Dubliners, inflamed moderate opinion in Ireland. This led to an independence war and a partitioned island. A Civil War over the terms of Irish Independence further divided Irish politics. A tradition of political violence reverberates in Ireland to this day. In the words of WB Yeats ‘a terrible beauty was born’. The GPO is thus a both contested icon of Irish Freedom, and Dublin’s all-purpose symbol of human rights. Its bullet-scarred portico is the focus for modern pageants, parades and demonstrations by activists of every political hue. 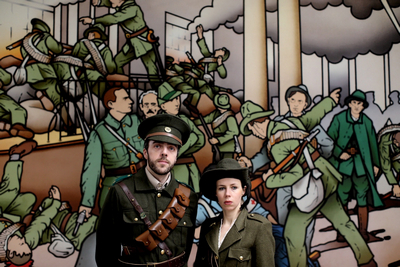 An Post - the Irish Postal Service saw an opportunity to create the flagship attraction for Ireland’s centenary ‘Decade of Commemoration 2012-2022’ whilst preserving the GPO as their operational headquarters. They constructed high-quality new spaces within the GPO’s courtyard to house ‘GPO. Witness History’ - a visitor centre, which is both a cultural venue, and a history museum. It aims to reclaim Ireland’s contested Revolution from a century of idolisation and demonisation. It operates as a self-financing commercial enterprise with ticketed entry. The setup funding came from central government. It covered €7 million for new construction and building refurbishment and €1.2 million for exhibition fit out. An Post spent a further €2.4m of its own money. The museum presents events from the perspective of witnesses on both sides, and caught in the middle. It highlights the European and global context. Themed zones present: the Irish Cultural Revival, Social Conditions; the Home Rule Crisis; and First World War; before the 1916 Rising, and the Irish Independence War; Civil War, and Reconstruction period after it. Within these zones ‘Memory Boxes contain an evocative mixes of genuine documents and artefacts, and reproductions of period costumes, uniforms and weapons. In successive zones a montage of posters on brick walls communicate the social cultural and political issues of the day, overlaying the tattered remnant of the posters of the previous time period. A touch screen on every display cabinet presents an overview pictorial narrative of each period, as well as the personal witness inherent in every object and poster. Video booths present a spectrum of views from expert commentators. Touch screens invite visitors to record their own analyses, and opinions. A 17-minute immersive audiovisual is projected onto a semi-circular glass wall. This puts visitors inside the GPO during the five days in which it was the Rebel military command centre, and well as inside the British HQ in Dublin Castle. 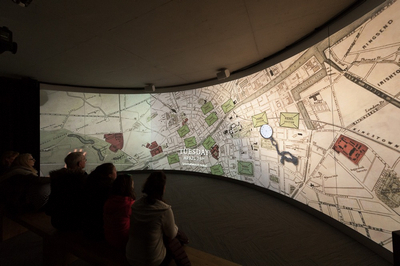 A detailed virtual recreation of central Dublin exactly as it was in 1916 is used to provide both street level drama, and a ‘God’s Eye’ strategic overview. Maps come to life with moving columns of soldiers, gunboats, trains, trams, armoured cars, etc. Visitors undergo the fury of the artillery barrage that reduced the centre of Dublin to ruins. They find themselves right inside a three dimensional version of Walter Paget’s famous tableau painting ‘Birth of the Republic'. A central interactive area is targeted at school groups and families. Touch screens are integrated into dressed sets of locations seen in the ‘Fire and Steel’ audiovisual. Visitors are challenged to:- print proclamations and bulletins; route military dispatches to beleaguered outposts; and use Morse code to proclaim the Irish Republic by radio. They can compare the living conditions of a wealthy child with a tenement child trapped in the crossfire. In the telephone exchange they can sort letters, and take phone calls. They are invited to sift fact from fiction, in a stream of rumours. They can follow events hour by hour on interactive period maps. Interactive info-graphics catalogue the physical destruction, economic consequences, human and political casualties. Visitors can compose reports, and evade censorship to get them onto the front pages of international journals. A digital Memorial Wall pay tributes to the GPO’s rebel garrison, in a manner that can be updated in the light of continuing archival research. The courtyard contains memorial sculpture honouring the children who died. The Commemoration Gallery at courtyard level charts the separate evolution of two Irish states, as well as the new all Ireland institutions resulting from the Peace Process. Commemoration of the Rising had changed, in line with the contested ownership, and conflicted attitudes of a democratic state to the un-mandated violence of 1916. Visitors are encouraged to post their own political and social aspirations for the future. The Public Office, exhibition galleries and the courtyard are all used for of thought provoking initiatives temporary installations, and specially commissioned theatrical dramas, dances, concerts, lectures, readings and other commemorative events. This will continue along with a rotation of newly acquired and loaned objects, to put alongside the important loaned private collection that forms the bulk of the displayed objects. Over time more of An Post’s working offices spaces can be converted into additional museum galleries and activity spaces. Many of Dublin’s distinctive emerald green post boxes predate the Rising. In the run up to the opening ten of these silent witnesses to history, at key locations, were repainted pre-independence Royal Mail red. Passers-by could use the stenciled ‘Freetext’ instructions to download dramatic mini-movies onto their smart phones. These recreated the scene at each location during the Rising. Viewers were encouraged to visit the GPO if only to discover the fate of the characters encountered. They could use their phones to book their visit. An Post also printed 80 million stamps in sixteen commemorative designs with embedded codes that also access relevant online information and videos. Figures on the stamps are paired to reflect an inclusive approach that would have been politically unthinkable even a decade ago. One stamp honours both the first policemen killed, and the rebel who shot him. Another, recounts the gallant deeds of two Dublin brothers, one a rebel fighter and the other a British soldier. As with the pillar-boxes, the code on the stamps, facilitates museum bookings. All areas of GPO Witness History are fully wheelchair accessible. To facilitate the hard-of-hearing, audiovisuals are subtitled in Irish and English. The texts on all touch screens and information panels are also bilingual. Multilingual staff members provide group tours in the principal European languages. Easy to use headsets present the narrative on all panels, videos, and touch screens in six languages to facilitate the visually impaired and self-guided visits by non-English speakers. Languages can be readily added to match future visitor profiles. Historically costumed storytellers provide encouragement, help, and detailed information with a human face.